8.5-inch tall candleholders/ shelf supports in Midnight Wisteria (medium purple). 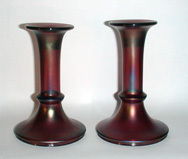 8-inch tall bugle-shaped candleholders in Egyptian Lustre (black stretch). These are most commonly found in Blue or Green. 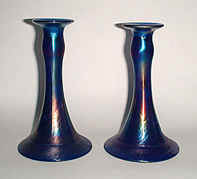 8-inch tall bugle-shaped candleholders in Blue Crackle (a cobalt blue crackle glass). Very difficult to obtain set. 8.75-inch tall "spindle" candle-holders in After Glow (pink). These are most commonly found in Blue or Green. 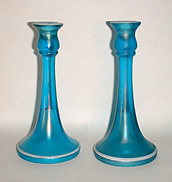 9-inch tall trumpet-shaped candleholders in Blue with white enamel trim. These can be easily confused with the Central 9-inch sticks, but ones with the white enamel are always Diamond! 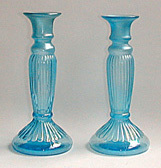 7.25-inch tall blown-molded candleholder/ vases in Blue. 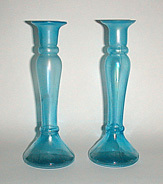 9 5/8-inch tall blown-molded candleholder/ vases in Blue. 7 3/8-inch wide by 3-inch tall candleholder bowl in marigold. The bowls usually have "PAT. APPLIED FOR" in the base. Usually found in Blue or Green. 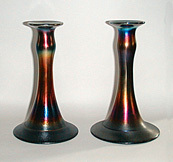 7.75-inch tall blown-molded candleholder/ vase in #900, "Adam's Rib" pattern, in Blue. Only known in Blue, Green and marigold.